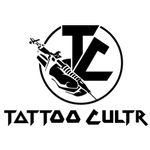 Tattooing today has changed vastly from where it started, and I am talking about professional tattooing here, not even traditional tattooing. 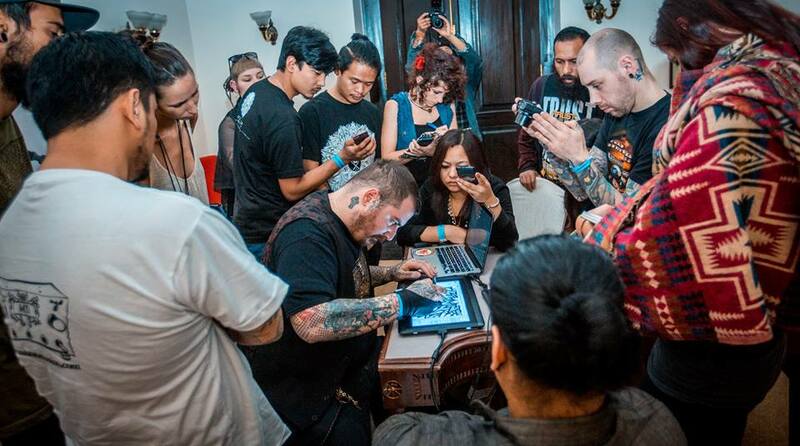 From how tattoo studios run to how aspiring tattoo artists go about their business, tattooing is no more the sacred shine that it was. But recently, I met up with one of tattooing’s modern masters, Orge Kalodimas to understand more about what tattoos actually mean, and what they are perceived to be in today’s age. 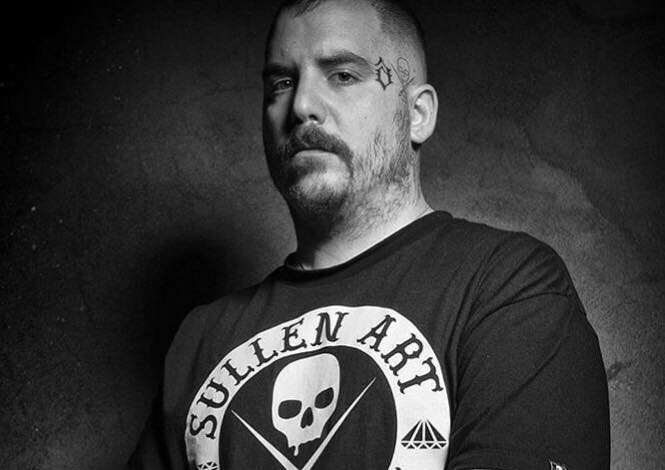 Orge shares very strong views on tattooing, and its different aspects. He reveals the reason why he deals with only black work, how the Eastern traditions and studies have inspired him, and much more in this freewheeling conversation. Shubham: How were you initiated into tattooing? Yeah… it was just me and Sake when it started, and now we are 20 people. Now, you are 20 people. It’s been a long journey, how long back was that? I was drawing in the beginning and we were friends. I was drawing realistic stuff but I couldn’t find…let’s say, meaning. I was just representing the images because my big hobby is reading and when I started reading about the eastern culture and eastern philosophies, Nepal, Tibet, and mysteries and all that got into me, and so I started drawing more with lines and more traditionally… like the book of proportions from Tibet which has the buddhas and everything. So, that’s how the shift happened. … to more deep meaning in my drawings. 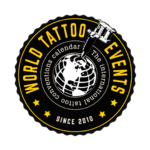 You have had very strong and wise words on the value and idea of apprenticeship in the world of tattooing. I would really like to know in today’s times when the entire idea of apprenticeship is changing very quickly, what’s your opinion on old school apprenticeship? I disagree with the way it is happening today. I think the idea of an apprenticeship with the master is a lifetime commitment. I still feel like an apprentice to Sake, even now after so many years I always ask him every day about what he thinks of my work and my apprentice is also like that, he always takes my opinion first of what he is doing and you need to be humble. Exactly… and you always keep getting better. If you think yourself that you are good and you are done, it’s over. 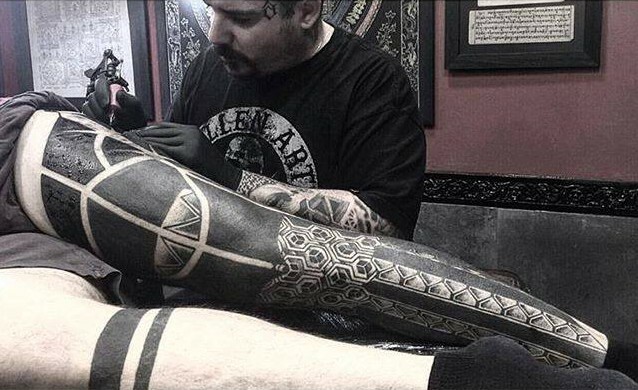 These days we see a lot of geometric tattoos on instagram and people find it really fashionable to just go for geometric tattoos at times, they just want the design to be on them. 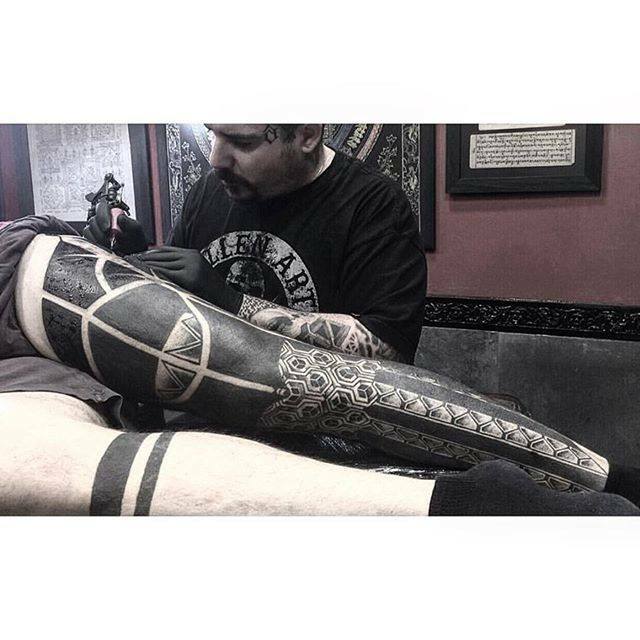 Would you want to see any sort of change in the perspective that you see around geometric tattoos and line work? I know right now it’s the whole thing around the world, but you don’t see a lot of sleeves or a lot of back pieces or a lot of body suits in that and I know it’s fashion but it’s fashion only to a small world. For me, a real tattoo is once you complete the sleeve, once you complete the leg sleeve, so he understands how the body moves or he incorporated the images, to make a simple image you know, a simple tattoo in the arm, just one shot tattoo, it’s easy… nothing is easy, but you know, it’s not hard. To combine all that and make a nice sleeve is where the true craft comes. So, I know it’s a trend right now, but the true craftsmen of the geometry lies with people who do sleeves, back pieces and large pieces. To tell you the truth, until now it was, you know, reading, a lot of reading and the nature itself because I use a lot of organic patterns and organic textures in my work. So, pictures in nature, water, rocks, leaves but right now, to be honest, the thing that inspires me the most is your culture. You know, I thought I knew some stuff but when I came here, I realized I don’t know anything. 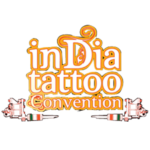 So, I already said to my friend and organiser of the Nepal Tattoo Convention, Bijay Sreshtha, that from now on, my career is about learning more and as much as I can from your culture because I want to put more meaning in my work and in my tattoos. You talk of reading, such a refreshing change to see because a lot artists that we get to encounter generally are not into a reading habit. So, I really want to know what sort of books do you generally read? I read everything, it’s a habit that I have since I was young. So, I read from a lot of history books, a lot of historic novels, and right now I read a lot of philosophy, a lot of Dalai Lama and I also read about how to improve yourself in business, you know like marketing, you know I read everything. So where have you reached on that count? Yeah, but I say if I do one book a month, maybe I will reach that number. This is how I always draw. I cannot understand colour and colour valuation. I never studied it and I don’t like it. Black and grey comes more naturally to me. You’ve become a mandala genius. We’ve seen some great mandalas, geometric works coming out of you but this is a question that comes to my mind because I had read the interview of this famous geometric artist and he said that at times the process of making mandalas becomes a little monotonous. Has it ever happened to you? Yes, Yes! Especially, when I was doing my book, the sources of mandalas, 184 mandalas, in six months, it was one mandala a day I did. So, after the first 30 days, I got into an artist’s block, I was just reproducing myself. It was then that I started to put more elements inside, open my mind a little bit, put animal skulls, deities, more nature elements, everything that I could find. It’s the key for anyone to have his own identity, to stop following rules and to just open the mind and see earth in everything and use that. Then, I think you will not be bored of doing the same thing. So for your geometric work, what sort of machines do you generally prefer, rotaries or coils? I do everything with coils except for dot work, for which I use rotary because it is precise, every stroke is the same, and it’s also light because when you do dot work with a heavy machine for a lot of time for a lot of days, your wrist is going to give in, but coils…I prefer coils. 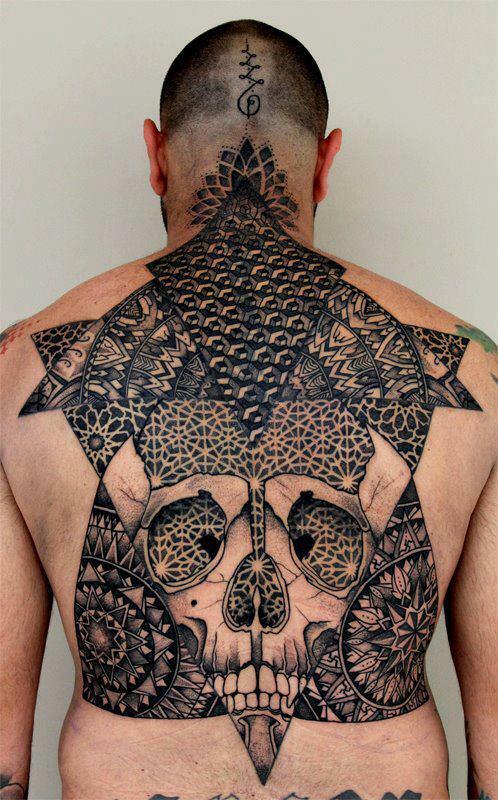 Who are the artists that have inspired you from the tattooing world? Of course, when I was starting it was Xed LeHead, and Mike The Athens, who were the pioneers in Tibetan and dot work. But after that, when I started opening my mind more, I started to like Guy Aitchinson in biomech, Jeff Gogue… I get inspired by a lot of traditional Japanese artists, I love Hanumantra’s black work, and of course I am mostly inspired by everyday life in my shop. Everyone is involved with drawing, so we inspire each other every day. Every one is telling each other, see what I did last night and you know everyone gets inspired, its like a small artist community and all the conventions that I go, I get inspired there too. My best friends are Maika Zayagata, Raph Cemo… every time I meet them I feel blessed that they are my friends because they are such amazing artists. You have to find inspiration in everyone and every thing and not just have your mind closed. I hate it when someone complains about copying; this is how art is, art is supposed to be shared with each other and if you put your art out there, it will influence a lot of people. So, you have to feel blessed that your art has inspired someone else and to make his life choice of art. I just want to say, yes, I am inspired by all those artists and I am happy that they are doing their best. Next Post Next post: Copyright or Right to Copy: Whose tattoo is it anyway?